In the US, all eyes are on the US big banks earnings due to be out tonight, both before & after the bell. A slew of economic data was out, mixed with a surprise climb in Dec retail sales; while Empire State Index, which measures US manufacturing activities continues to contract in Jan, for sixth straight month. Yesterday night (Jan 14) saw a bullish USDA (US Dept. of Agriculture) report send corn, wheat, & soybean price soaring in overnight action. That helped lifted SoyOil price, which had been moving in tight range of 49.50-50($US cents) for days, up about 1.20cents to high of 51.70cents in early Tuesday morning. Which was a huge move, considering the normal day range of SoyOil futures is only about 0.5-0.7cents. Thus, sent our CPO price gapping up at open today, slipped right out of the downtrend channels I mentioned in previous post. However, volume wasn't entirely exciting yesterday, hence I will not consider the opening gap a change to the previous bearish sentiment. true enough, price then move in boring tight range of 2,380-2,400, then closed at 2,397, near its opening price. 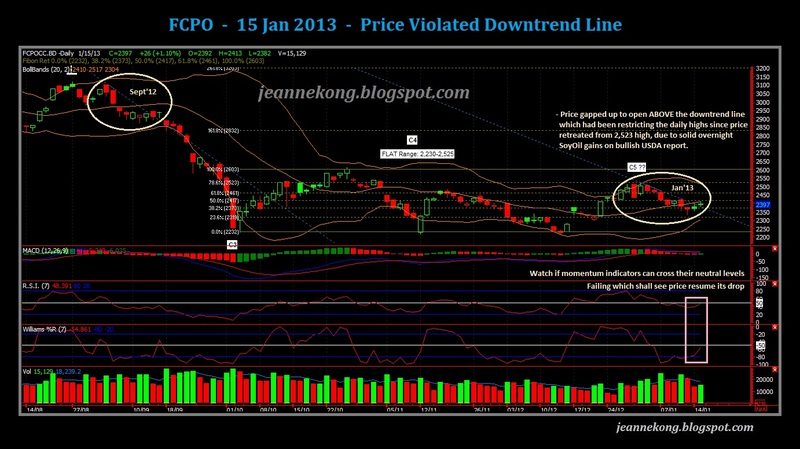 Tomorrow might be another tight range day for CPO, barring any gaps at the open. Whether we will see the previous drop from 2,523 high continues or reverse from here, it will depends on which side the breakout from this tight range consolidation occurs. I'm keeping my bearish stance, expecting a downside breakout to find 2,230 psychological support, completing the H&S pattern. In fact, I did a preliminary wave count on CPO (as marked on chart), & expect price to indeed break below 2,230 major support, in a C5 down wave. However, I have to say my experience with CPO is still shallow, I have no idea whether the price will drop while CPO tends to trend higher from Jan through April/May due to seasonally lower production yield. Price continue to waver between the boring 1,685-95 range. Notice that price is just a few ticks away from the gradually plateauing BB mid-band. While the outer bands squeezing in further & flattening out too. 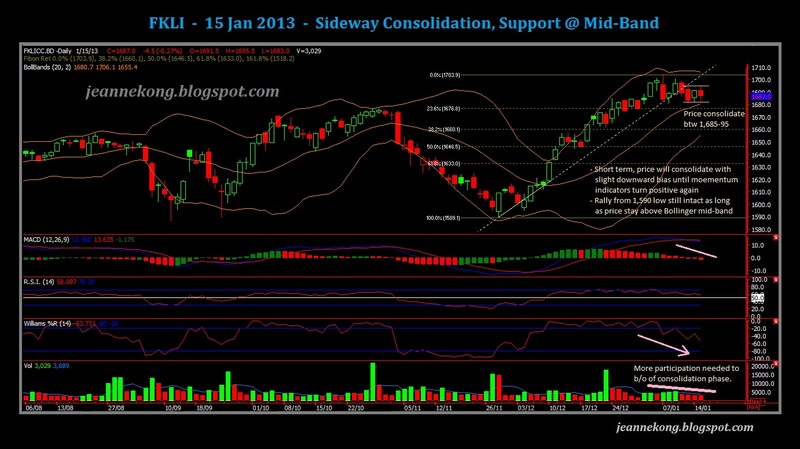 With low participation from traders, consolidation may well continue for a while more. 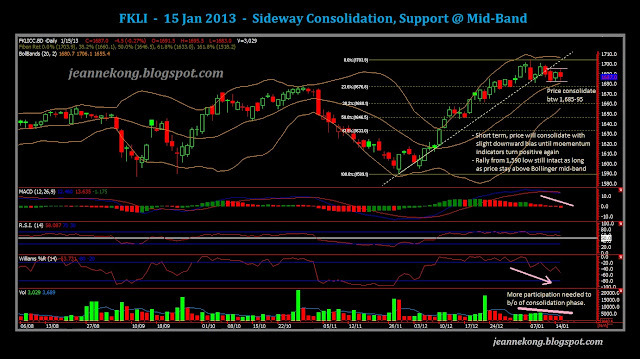 Continue to monitor the momentum indicators which may signal end of consolidation, by reaching their respective buy levels, while price tries to find support on the mid-band. Nothing much to add, until we see more solid volume coming in. Not '$50' as in the original post. My apology. Made amendment to the SoyOil price in the post. Credit to Lau_EH who took the time to email me on the error. By the way, those interested can check out this site that provides real-time SoyOil CFD quote, foc.